Preheat the oven to 425. Coat the beets with a little olive oil, and roast for about 20 minutes, till they’re sizzly and just starting to brown. Meanwhile…bring a small pot of water to a boil. Drop in the beet greens and cook for about ten minutes, till they’re completely soft, drain. Warm about a tablespoon of olive oil in a large frying pan over medium heat. Add the garlic and dried basil, and cook until the garlic just starts to brown. Add the beet greens and stir and fry till they’re coated with oil and cooked through, and till the pan is mostly dry. In a food processor, combine the beet greens, the eggs, the milk, goat cheese, mozzarella, cayenne and salt and pepper. Process till pink and smooth, though it’s nice if it’s flecked with bits of leaves. Roll the dough to be the size of your (buttered and floured) tart pan, and press it in evenly, trimming the edges to be pretty. Bake for about 10 or 15 minutes, till it just loses it’s shininess. Remove from the oven. Sprinkle the chopped arugula over the bottom of the tart shell. Pour the custard over, and then arrange the roasted beet slices prettily on top. Bake for about half an hour, till the custard is puffed and starting to brown. 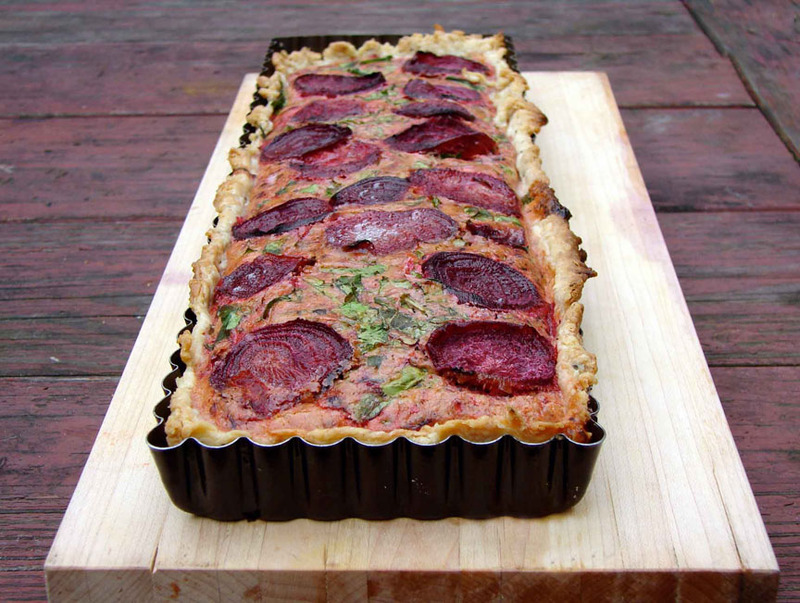 This entry was posted in crust, pie, recipe, Uncategorized and tagged beet greens, beet tart by Claire. Bookmark the permalink.